View the report to the IAU on the main scientific program: Post Meeting Report IAUS 335. Other shorter reports to co-sponsors are also available: VarSITI grant 2017 report borrowed from VarSITI Newsletter Vol.15, the December 2017 IAGA newsletter 54, the (COSPAR) Space Research Today Meeting Reports Volume 201, April 2018, Pages 33–35. Some presentations are made available here to conference participants. Reports on the parallel education program include: a summary for the IAU Astronomy Outreach Newsletter (#1 December 2017). 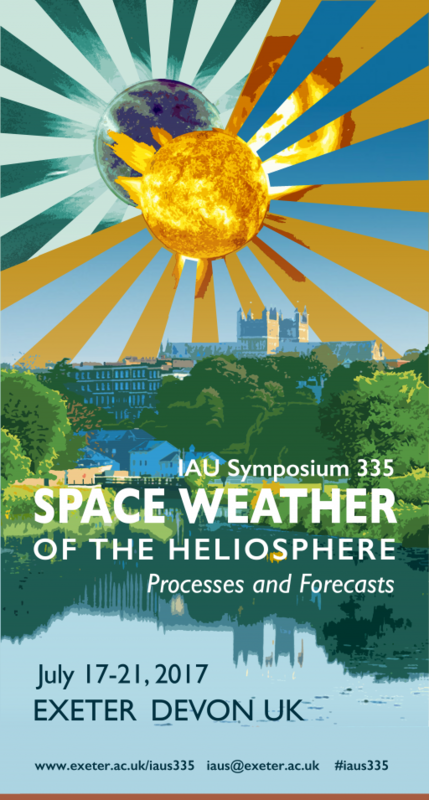 The conference poster shows two seasons in the activity cycle of the Sun, to represent the changes in space weather, against the backdrop of the Exeter cathedral and its reflection on the Exe estuary. Like a reflection image on the river, progress in forecasting needs to reflect advances in fundamental science.